A mid to high altitude fir that has previously been impacted by logging. It is assessed as Near Threatened. 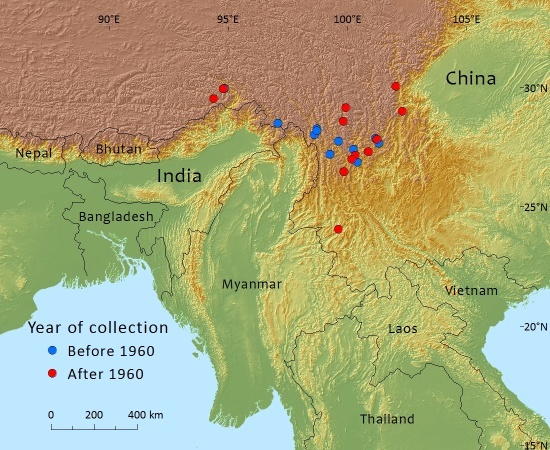 The species (and its varieties) occurs in the high mountains of SW China at elevations between 2,400 m and 4,300 m a.s.l. (commonly 3,000-4,000 m), on grey-brown mountain podzols. The climate is cold and wet, annual precipitation ranges from 1,000 mm to 2,000 mm. The species forms forests in pure stands near the tree limit, or is mixed with Picea likiangensis, Larix potaninii, Tsuga dumosa and some broad-leaved trees, e.g. Betula albo-sinensis, Acer spp. and Sorbus spp. at lower elevations. An ericaceous lower shrub layer with Rhododendron spp. is often prominent. Abies forrestii var. 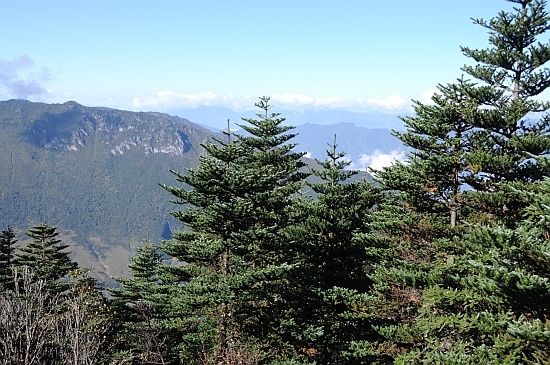 forrestii is assessed as Near Threatened (NT) as it occurs at lower elevations in the Lijiang and Muli districts where there has been significant deforestation. While the information available is not sufficient to assign a Vulnerable status under criterion A2cd, the use of NT is considered appropriate as highlighting a possible situation which may need to be addressed in a future re-assessment. Logging has been the principal threat. Exploitation has (at least officially) ceased with Chinese forest conservation law now prohibiting logging in old growth forest in the western provinces. The Government of China has recently imposed a logging ban in western China. This variety is present in a number of protected areas. Zhang, D, Katsuki, T. & Rushforth, K. (2013). Abies forrestii var. forrestii. The IUCN Red List of Threatened Species 2013: e.T191561A1989116. http://dx.doi.org/10.2305/IUCN.UK.2013-1.RLTS.T191561A1989116.en. Downloaded on 01 December 2016. P.Thomas, 2016. Abies forrestii var. forrestii, from the website, Threatened Conifers of The World (http://threatenedconifers.rbge.org.uk/taxa/details/1124).